Home maintenance problems vary by the season. A typical winter problem occurs when the door locks begin to turn sluggardly in cold weather. This may be caused by moisture inside the lock that freezes or by an accumulation of dirt and oil over an extended period of time. Door locks come in a variety of sizes and types. A door lock has a direct entry to its inside mechanism -- the key hole. Moisture from rain, snow and ice easily enters the key hold and is protected from evaporation by settling into the many nooks and crannies of a lock. During any season but winter the moisture causes little problem, but in the cold it can freeze and prevent the lock from turning. Enough moisture may even prevent the key from going into the lock. There are several techniques that can unfreeze a door lock. Heating the key briefly with the flame from a candle, match or cigarette lighter may do the trick. This can be difficult when the hands are covered with thick gloves or mittens. Lock de-icers are available in small pocket-sized tubes and larger spray cans. These can be squirted into a frozen lock to quickly displace the ice, allowing the key to open the door. Look for a de-icer that has silicon as its primary ingredient. 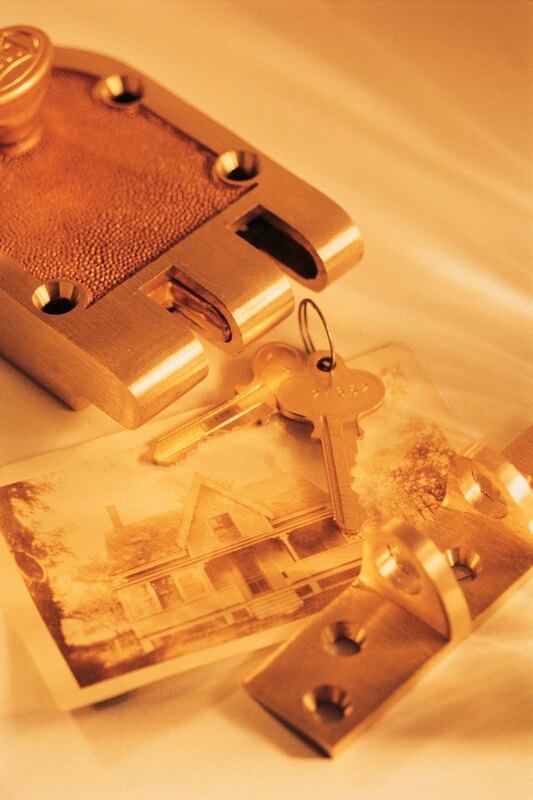 Preventive measures can help you avoid lock problems at a later date. Spraying a silicon de-icer into the lock before the winter season starts keeps ice from building up in the lock. But ice is not the only problem with locks in cold weather. Fingers have natural oil on them, which is gradually transferred inside the lock as keys are used. Over time, and depending upon how dusty your area is, the oil can combine with the dust that creeps in through the key hole to make a gooey mess. The combination of oil and dust generally doesn't cause a problem in warm weather, but when it turns cold the gunk can freeze solid, leaving a lock that just won't turn. Most door locks are designed to be removed with two screws from the inside, and taking them apart before the cold comes is a matter of a few minutes. Washing the inside of the lock with dish detergent and water and then drying it with a hairdryer will have the lock quickly working again. Before you put it back together, spray the insides with silicon lubricant.